The Modern Classroom gives great prominence to each student’s nutrition and holistic well-being, instigating an interest in culinary arts. 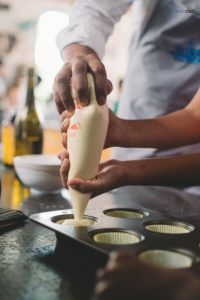 In association with Slurp Studio, we curate an exclusive day programme, engaging students in a cooking master-class where they cook their own gourmet meal from scratch. A quaint aura environs the studio with an open kitchen and a charming retro décor. Food being the most essential part of us, we want to ensure each student gains practical exposure to achieving a nourished body and a tranquil mind. Each student gets a certificate for partaking in the programme and take home delectable goodies. What is Cooking? How do flavour profiles affect our food preferences? How will the Tour Help Students?